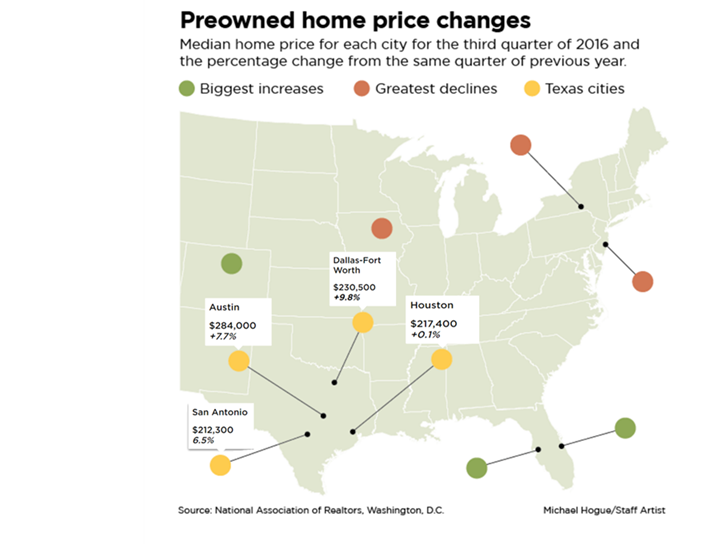 ​​​​TEXAS – Existing h​ome costs in Dallas-Fort Worth rose by almost twice the national rate in third quarter 2016, continuing the streak of big price increases. DFW m​​edian home sales prices were 9.8 percent higher than in third quarter 2015, according to the National Association of Realtors' quarterly home price report. Nationwide prices were up 5.2 percent in third quarter from the previous year. Real estate agents blame the tight market and booming demand for homes in some areas for running up home price tags. ​The nationwide median home sales price in third quarter 2016 was $240,900. The greatest price gains were in Palm Bay, Fla. (18.7 percent), Tampa (15.2 percent) and Boulder, Colo. (14.7 percent). Prices rose in 155 of the 178 markets the Realtors track each quarter​.